Infiltration of illegal African immigrants is down to almost zero, and Netanyahu vows to send back home those who already have entered. Infiltration of illegal African immigrants is down to almost zero, and Netanyahu vows to send back home those who already have entered Israel. The long-absent fence along the Egyptian Israeli border from Eilat to Gaza is to be completed by the end of next month, and Arutz Sheva has learned from military sources that Africans finally have understood that they have little chance of illegally crossing the border and entering the country, let alone staying here. 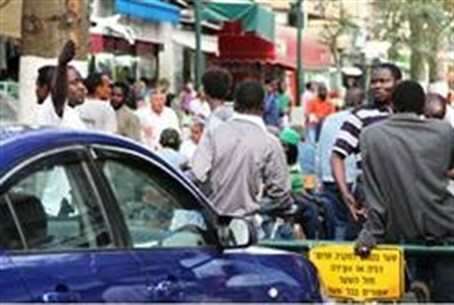 Prime Minister Binyamin Netanyahu said on Monday he aims to repatriate tens of thousands of African illegal migrants. "Our aim is to repatriate tens of thousands of infiltrators now in Israel to their countries of origin," he said, adding Israel had been in contact with several African governments. Israel began constructing the southern border fence in late 2010 to stem the influx of thousands of illegal migrants through the porous border, which has also been a major drug, human trafficking and terrorist route into Israel. "Now we are moving on to the next stage, the repatriation of the infiltrators already here,” the Prime Minister was quoted as saying in a government statement. Interior Minister Eli Yishai had warned in August that Sudanese illegals who did not leave the country by October 15 would be detained, held in camps and deported. Israel already began expelling South Sudanese in June, after Yishai ruled they were no longer at risk in their newly independent homeland. An Israeli court the same month gave the green light for plans to repatriate around 2,000 illegal migrants from the Ivory Coast.